FALLS CHURCH, Va. (MEDIA GENERAL) — A manhunt is underway for a prisoner believed to be armed, dangerous and on the run from a Virginia hospital. 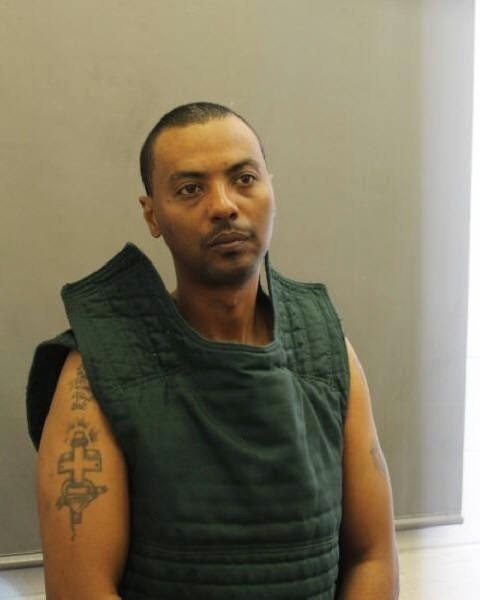 The prisoner, Wossen Assaye, is believed to have overpowered a guard, stolen a gun, and carjacked a woman in order to escape authorities in Falls Church, Virginia. Assaye is no small-time criminal. Investigators believe he may be connected to as many as 12 bank robberies in the Virginia area. At the time of Tuesday’s escape, he was being held on federal bank robbery charges. Court documents reveal just how brazen Assaye is and what led authorities up to this point and what is now an all-out manhunt for an armed and dangerous criminal. The FBI along with a number of other law enforcement agencies have been looking into a series of 12 bank robberies in Eastern Virginia from October 2013 until March 20, 2015. Assaye is being held as a suspect in those cases. Assaye has previously been convicted for multiple statutory burglary and robbery offenses from 1998-1999 in Virginia. He spent 2000 to May 2013 behind bars. And, he was on probation at the time of his recent arrest. The bank robber in all 12 of the recent cases followed a similar pattern, according to investigators. The person enters the bank, often with cell phone to his ear, he approaches the teller, shows a gun or a note and verbally demands money. After getting the cash, the man flees on a bicycle. The suspect’s face has been captured on surveillance camera or video in a number of these robberies. He’s been described as a thinly built black male, and all the surveillance video from the various banks appears similar. The suspect has also been said to have an African accent, possibly Ethiopian, according to witnesses. In each instance, the bank robber got away with various amounts of cash, anywhere from $757 to $9,963, according to court documents. Remember the bank robber used his cell phone during the robberies, and that appears to have been his undoing. According to investigators, in January of 2015, Sprint gave the FBI information from towers located near the robberies during certain timeframes. Using that data, the FBI was able to connect one common phone number to the location and timeframes of the robberies. That number was attached to Wossen Assaye, 42 from Ethiopia. Mug shots showed he looked similar to the bicycle bank robber. Below is the arrest video and news briefing .